There are very few truly iconic movie cars. There are even fewer cars like today’s Nice Price or Crack Pipe Mustang that try to recapture that movie magic for today’s enthusiasts. Let’s see if this Ford’s price makes it box-office boffo. Let’s be honest here—if you’re going to have a special edition car, notably one made fancy by its exclusive paint and interior trim like yesterday’s 2000 Mercedes E320 designo, adding your own personal touches isn’t likely to enhance its attractiveness to others. Come on people, you’re not Kylie Jenner. It was the seller’s personal touches—vinyl wrap, and of all things, just for show hood pins—that really dinged that fancy Benz. Those, and an ominous intermittent CEL, ensured the car’s $3,200 price wouldn’t be a slam dunk. In fact, at the end of the day it took home an impossibly close 50.15-percent Crack Pipe loss. It’s a new day and we have a new car to celebrate. Well, actually we have a sort of middlingly old car, and one that is emulating an even older model that for some reason gained legendary status for having been featured in the 1968 film Bullitt. The movie’s Highland Green over black vinyl 1968 Mustang GT earned its rep for being the good guy’s ride, and participated one of the most thrilling car chases in Tinsel Town history. It seems that pretty much everything that actor Steve McQueen touched has turned to gold, which makes the Bullitt Mustang kind of spacial. It’s also part of the reason why the Tag Heuer Monaco remains so popular today. Here’s the thing though. Bullitt celebrates its 50th Anniversary this year and outside of of its legendary chase scene, a few people—including some of the young guns on our crew—find the film, let’s say wanting. That seeming lack of modern day relevance hasn’t stopped Ford from issuing no less than three homage models of the film car since 2001. This 2008 Mustang Bullitt represents from the second run of those, of which 5,772 were built that year. An additional 810 were cranked out for the 2009 model year. What makes a Bullitt a Bullitt? Well, first off there’s that iconic Highland Green paint. That’s pretty much de rigueur if you want to be true to the movie. Not everybody does however, and the ’08/’09 models could also be ordered in black. Only about a quarter of the cars were built in that non-traditional hue. Along with the Green bodywork came gray-painted calipers, special badging, five spoke alloy wheels, and a de-badged nose. Inside, the car received an aluminum cue ball shift knob, more aluminum appearance pieces on the doors, pedals and dash, and a GT500-esque steering wheel with Bullitt logo lest you ever forget that oddball spelling. The engine is a 315 horsepower SOHC 4.6 Modular V8. That’s 15 more ponies than in the standard GT and are made possible by way of a cold air intake and remapped ECU. Behind the engine lives a Tremec TR-3650 five-speed stick, again with that fun in the sun heat-sink shift knob. This particular Bullitt comes in the traditional green, and with a modest 122,820 miles on the clock. The bodywork is far closer to the ’68 edition of the movie car than anything else in between, but it should be noted that, especially in stripped down fashion like on these cars, the S-197 ‘Stangs do look a little parsimonious and even kind of chintzy. Paint here seems decent, and the plastic headlamp covers appear clear and clean. The wheels do seem to suffer a bit of curb rash, although it looks like something that could easily be buffed out. The car is riding on a set of Kumhos in back and something else in the front. Burn out much? Pop one of the long doors open and you’ll be confronted by a dark cave of an interior, punctuated by a sprinkling of bright trim and an engine turned pattern on the retro dash. Everything in here looks as tidy as a 2008 Mustang interior can be, with the notable exception of the steering wheel, which is grungy around the rim. I don’t know what it is about the leather Ford uses on their tillers, but it has been my experience, and it is born out here, that the material just doesn’t stand up to extended use. Aside from that, you’ll most likely dig the retro gauge font. You won’t like the broken button on the stereo, but that’s an easy replacement should you really be interested in listening to something other than that sweet 4.6’s exhaust note. The title is clear, and the car is offered in the contradictorily named Humble Kingwood in Texas. How much to pretend you’re Steve McQueen’s long lost illegitimate child? The asking is $11,980, and should you be up on your Bullitt pricing you’ll no doubt note that’s on the low end of the spectrum. The thing of it is, an ’08 GT which offers 95% of the experience here, could easily be had for about three-quarters the price. Does the retro movie homage make up the difference here? 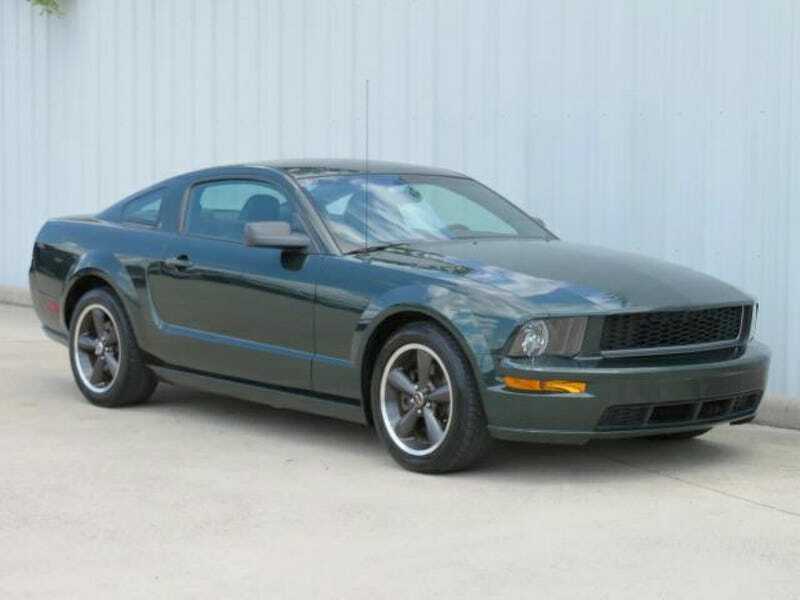 What do you think, is this Bullitt worth that $11,890 asking? Or, is that price a total misfire? Houston, TX Craigslist, or go here if the ad disappears. H/T to WineWhore for the hookup! At $3,200, Would You Put Your Designs On This 2000 Mercedes E320 ‘designo’ Edition? At $18,999, Will This Custom 1989 Ford Mustang Boss 5.0 Cause A Stampede?